Imagine for a second you are the government of a European nation. Go on, you pick one, a good one. Now, a few decades ago, you happily owned the major international airline that operated out of your nation. 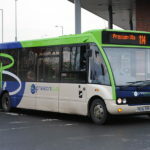 You were able to set the fares, landing slots and collect the vast majority of the profits too. Good times all round. But a lot has changed as the last 20-30 years have passed by. EU agreements have opened up the skies to private airline operators (especially those with ‘budget’ ideas in their minds). Big national airlines have been broken up, sold off or privatised, in part due to their size and the resources required for operation but largely for the strain on both the government and the taxpayer. Suddenly the skies above Europe aren’t the place for governments to invest, to make money, to deliver taxpayer return. So, what other trans-European, high-speed, relatively-cost-effective-to-operate mode of transport could take its place? The railway, of course. The government of Austria thought exactly the same, or rather… “die eisenbahn, natürlich!”. OBB (the Austrian national rail operator) had spent many years operating successful long-distance inter-city services reaching out to the likes of Germany, Hungary, Italy and the Czech Republic, but budget airlines had started to nick both their passengers and their profits. 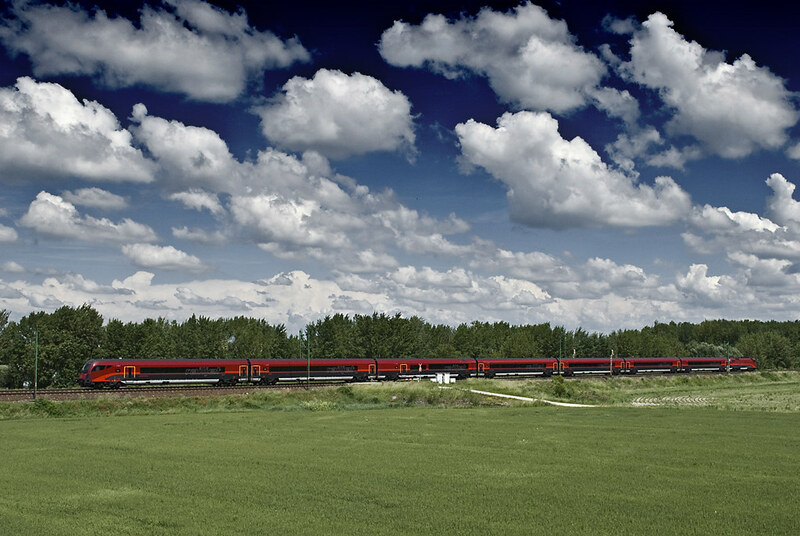 It was time to reinvent their strategy and like many other operators had done across Europe, look to the skies to inspire their new rail product. 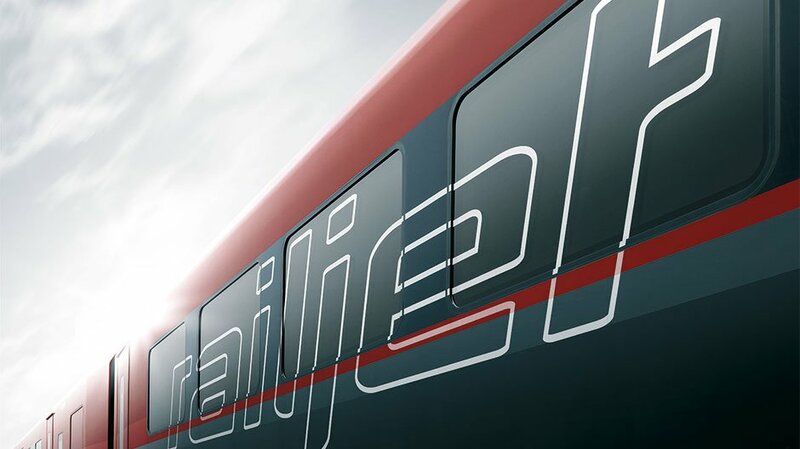 In late 2005, the concept of ‘Railjet’ was born. 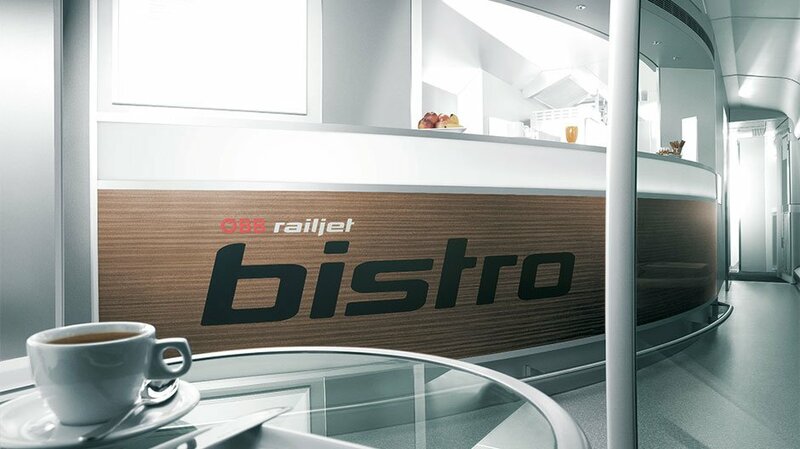 However, in a reverse decision to the like of SNCF and SNCB created brands to directly compete with budget airlines offerings, OBB decided their Railjet product should focus on elevating rail travel above the standard set – making rail a genuinely desirable offer, not just in terms of a getting there whilst saving a few pennies. The business market is a huge travel (and profit) opportunity for all carriers, road, rail or air, right across Europe, and Railjet was aimed to tap in to that, giving business customers what they miss at 30,000ft. Essentially, OBB aimed to create a brand new airline, but keep it firmly on the ground. 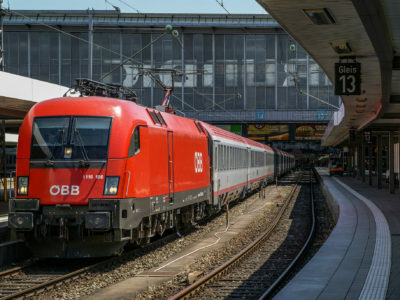 It was deemed new rolling stock should be procured for OBB’s new airline-on-the-rails venture, to shift the perception of Austrian rail travel and surpass the varied fleets of commercial aircraft in use across Europe. 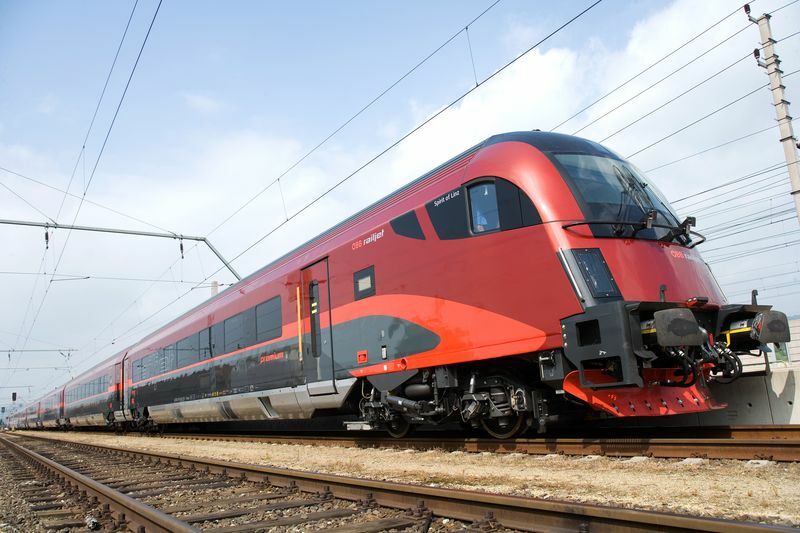 Siemens had recently supplied OBB with a fleet of Taurus Eurosprinter locomotives for their inter-city services, the quality, speed and reliability of which were much admired, so it was an easy decision to keep these and let them form the power units for the new Railjet fleet. In early 2006, Siemens were given the order for the rest of the rolling stock, 23 sets of 7 coach trains, the rear coach of each set to be fitted with a ‘DVT’ style end (driving van trailer) containing both passenger seating and a replicated Siemens Taurus cab, giving the sets full push-pull ability and maximum flexibility. Uniquely it was also decided that on some routes, trains could be coupled together to form 14 coach trains, with a locomotive at one end and another effectively in the middle – a rare formation across Europe and much of the world. In late 2007, OBB further contracted Siemens to build an additional 44 sets, as it hoped to extend its Railjet service further and wider than its inter city services had ever run. 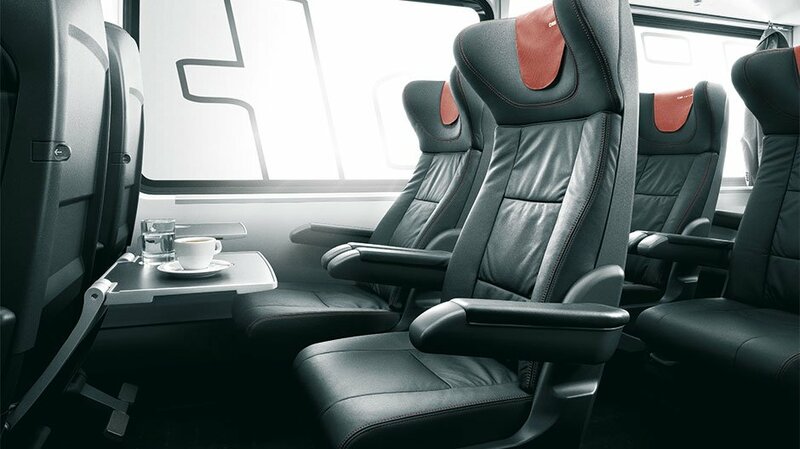 During the development phase of the train, famed Austrian industrial design agency Spirit Design were recruited to provide a full interior scheme and exterior style for the trains. Internally, Spirit proposed a unique three-class interior, comprising of Economy, First Class and Business Class – very much akin to what one would find on a modern long-haul airliner. Note the use of the word ‘Economy’ too – not a common use term in rail – it really was felt that this product should bring the best of aviation on to the rails. High quality materials included polished metal and wood finishes replaced your typical train interior finishes of steel and plastic. Both First Class and Business Class were fitted with deep reclining leather armchair-style seats. First Class being formed into a typical rail style 2+1 layout whereas Business Class (Railjet’s top service level) saw something even more special – uniquely staggered seats, with inbuilt leg supports, separate side tables and reading lights, grouped together in special compartments, allowing colleagues to travel and work together, whilst still enjoying the Railjet service and experience. This feels like a real step up from most trans-European trains – the notion of compartments where business-types can meet and eat whilst travelling to their destination went out of most European trains as operators sought to put as many bums of seats as they could. 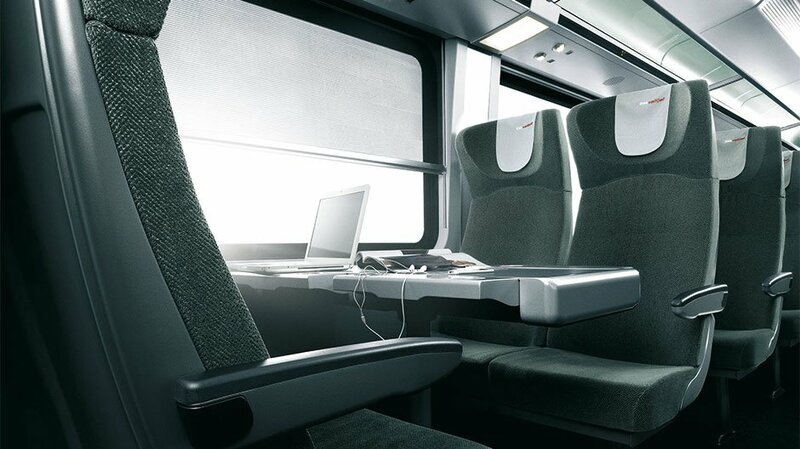 To reaffirm what I said at this start, this really shows how Railjet have understood that to tempt business people out of the sky, you’ve got to give them what they miss on planes – a well-connected space and place to continue working, a mobile office on rails. 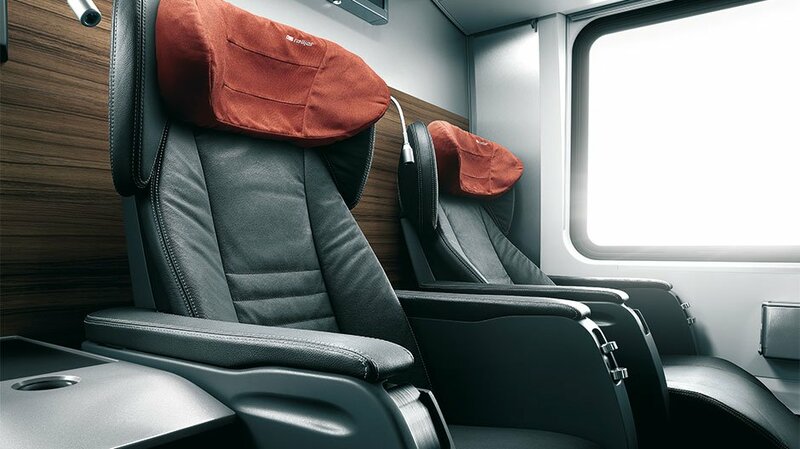 Internally the darker colours choices and high quality textures and materials throughout, teamed with the splashes of OBB red, give a really premium feel – easily beating the interior styling and space of most European airliners. Large windows, glass partition doors and a dark-floor-to-light-ceiling approach maximises the feeling of space on board too. It can easily been seen how much of a good job both Spirit Design and Siemens have done and how well thought out the interior spaces are. Throughout the train, TV monitors are present, showing the train’s progress, speed and a ‘moving map’, which gives the train’s location both on the Railjet network and nationally, at that time. In Economy, Railjet also added the unique feature of an area where parents could take small children to watch cartoons and movies as they are shown on a small cinema style screen. In fact getting up and moving around the train seems to be positively encouraged – a full-service restaurant coach and separate bar area is included on board – again to highlight the difference between what you can get on the rails and the squeezed-into-your-seat approach of most airlines. Externally, Spirit Design produced three different concepts for the livery, which were to be tested on 1:1 scale – no illustrations or models produced for board members here – three of Railjet’s Taurus locomotives were painted in each of the colour schemes. Two of the locos received an OBB red base colour, with grey/white and grey/red striping respectively and the final received a bordeaux-red base colour with grey/red striping. They were also duly named as Spirit of Salzburg, Spirit of Linz and Spirit of Vienna. OBB then asked Austrian tabloid ‘Kronen Zeitung’ to conduct a nationwide poll, via its website, to pick a winner. 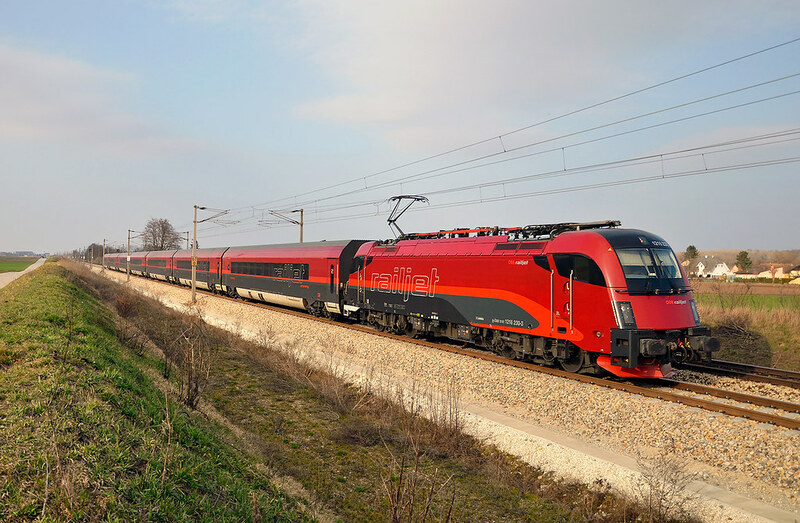 In late 2007, the results were in, the third colour scheme featuring the bordeaux-red base colour with grey/red striping was the winner and became the new design approach and style for all Railjet rolling stock, uniforms, marketing material and more. 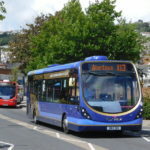 A unique approach for a livery taken by OBB which, I suspect, was to match the unique service they were trying to build – plus the more you ask people for their opinions and thoughts on a transport concept, the more they will want to come and try it for themselves, usually with a feeling of ‘I had a hand in creating this’. So, yes, the Railjet exterior. Personally its one of favourites across Europe right now. The dark, deep bordeaux red gives a premium feel against OBB’s regular services. The grey lower bodyside with red keyline also adds to that – and the way it forms a train-like pointed motif on both the DVT and locomotive ends evokes a feeling speed and dynamism. It’s a modern, business-like design that has a more than a hint of ‘airline’ about it. My favourite feature of all though is the addition of the large ‘Railjet’ lettering on the bodyside of every vehicle. When it comes to putting a brand name on a train, most companies would say “well just stick it in the middle and make it about the right size” – Spirit and OBB said different – as you can see the lettering takes an impactful stance across passenger windows, and is punctured by the bold red stripe as it streaks along the side of each coach. By using an outline version of the brand’s font in a large format, the name becomes bold and noteworthy, but doesn’t block the view of customers inside. Overall it’s just a great looking train set. 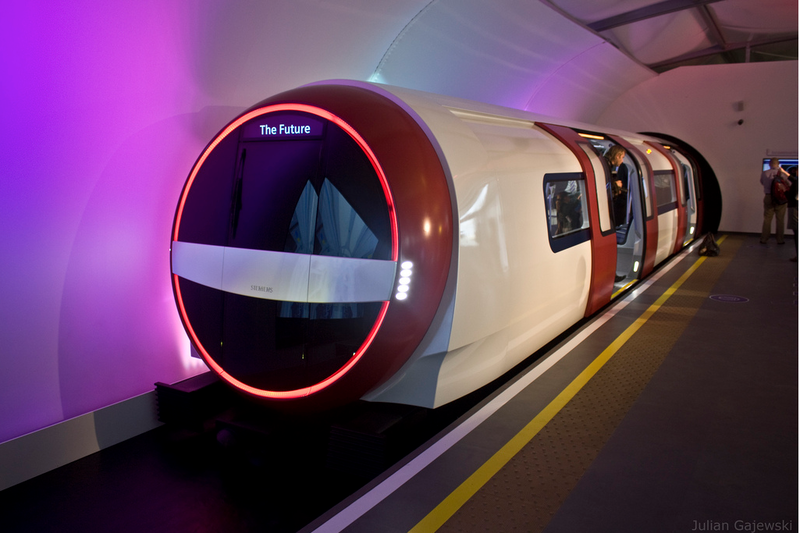 Siemens have done a superb job of creating a modern, sleek train and Spirit’s livery works with the architecture of the set itself to add curves and style in the right places. 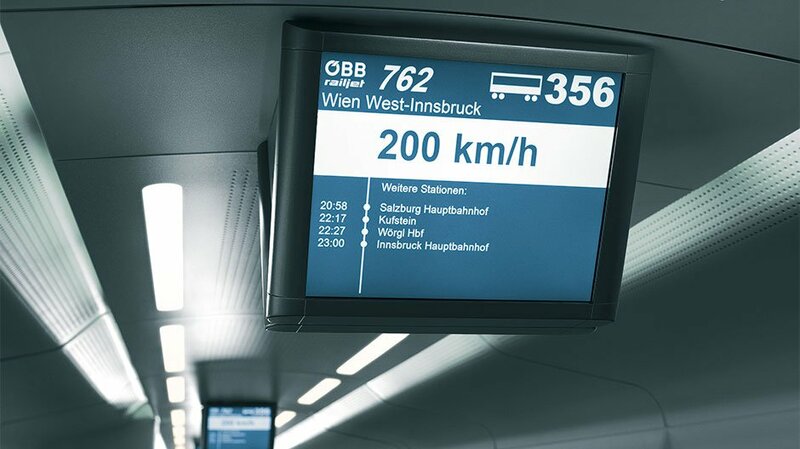 Railjet services formally began in December 2008 running up to speeds of 140mph right across Austria, connecting to major cities in most neighbouring European nations, and very soon it was clear, OBB had a hit on their hands. 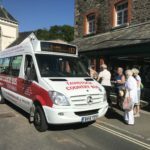 Customers loved the premium-feel surroundings, the on-time service and the space available onboard the train. By creating a produced that ‘one-upped’ the airlines in every way, and concentrating on what really matters to customers travelling on their routes (not just fitting out trains as to how they ‘thought’ they should work but undertaking research and bringing in the right experts), OBB have got it just right, brand-wise, product-wise and seemingly profit-wise too. So, next time you’re considering jetting across Europe, between cities like Frankfurt, Stuttgart, Munich, Salzburg, Prague or Budapest, why not jet yourself there in a different way? Give yourself a real branded treat and hop onboard a Railjet. 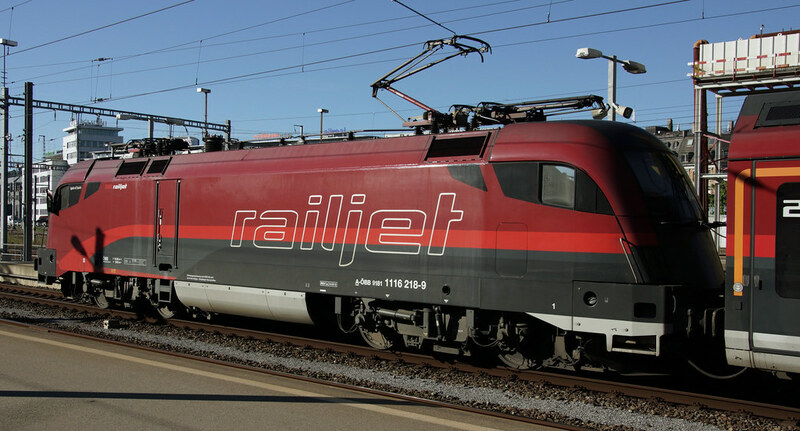 Personally, I’m excited to see where the Railjet brand goes next. 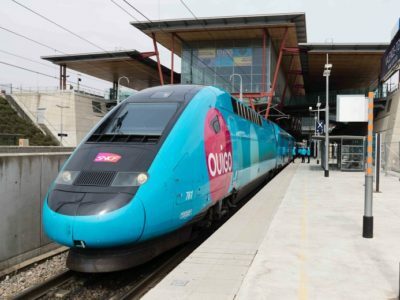 Recently, OBB have extended a similar style (although less premium) and naming strategy to their new regional train services, naming them as ‘Cityjet’ and the Czech government’s rail division ‘České dráhy’ have began operating their own Railjet trains on their Prague to Vienna route, carrying with them a new blue colour scheme (which doesn’t look anywhere near as premium to me). 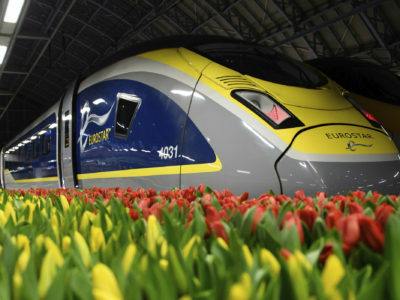 The Railjet concept truly works, let’s hope other countries across Europe see the example set and bring their service levels, interior styles and exterior branding up to meet it – the eventual goal being more choice for the customer (rail vs air), and an elevation of what people expect from their trans-European train journey. So, what do you think? Is Railjet setting a new standard, or is it just a good concept that will still easily get beaten by those budget airline types? Write in the comments below, or drop us a tweet – @transportdsn and @samthebox!